Our school has a close partnership with the St. Giles Parish Church. Thank you for visiting our website. Whether you are visiting as a prospective pupil, parent, teacher or Governor, we hope to provide an insight into what’s on offer for our children here in the community of Killamarsh. 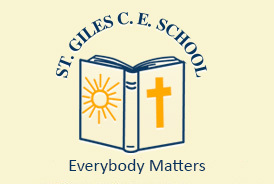 St Giles is a vibrant, thriving school with high academic standards, where a strong emphasis is placed on the individual child, within a Christian ethos of love and mutual respect. We are part of the Derby Diocesan Academy Trust (DDAT), having converted on 1st September 2017. Everybody Matters at St Giles. We have a highly inclusive outlook, and place a fundamental importance on safeguarding and protecting our children from harm at all levels and in all forms. We encourage our children to make the most of the many opportunities we give them, so that they are highly motivated to learn and are prepared for the next exciting stages of their lives. The partnership that the school develops with parents makes a profound contribution to the successful development and achievement enjoyed by our children. Parents have a vital part to play in what the school seeks to do and can help children come to school prepared, equipped and ready to play a full part in the caring, family atmosphere here. We have high expectations in work, play and social behaviour so that each and every child will benefit from an inspirational experience at the start of their school lives, and where they can feel happy, secure, valued and loved. Come and visit us – we look forward to seeing you in school! St Giles aspires to be an inspirational, caring and inclusive school where every individual will flourish, be celebrated and nurtured in God’s love. Providing a moral and spiritual framework based on Christian values, enabling decision making for life. Setting clear and high expectations for social behaviour, empathy for others, forgiveness and reconciliation leading to self-discipline and mutual respect. Giving children the confidence to persevere and develop resilience, achieving excellent academic standards. Establishing strong relationships with parents, based on listening, effective communication and mutual support. Encouraging and challenging children to aim high and flourish within a vibrant and inspirational curriculum that meets each child’s needs. Placing creativity at the heart of learning, fostering curiosity, awe and wonder at God’s creation. Promoting active learning, team working, problem-solving, discussion and debate. Enabling children to use technology responsibly for learning and leisure. Ensuring that children have high self-esteem, respecting the views of others and celebrating different ways of life, races and religions.